You bought a cable tube conveyor. They share many of the advantages of Chain-Vey, but the replacement of the cable conveyor parts, whether during routine maintenance or an unexpected event has you considering a stronger option. 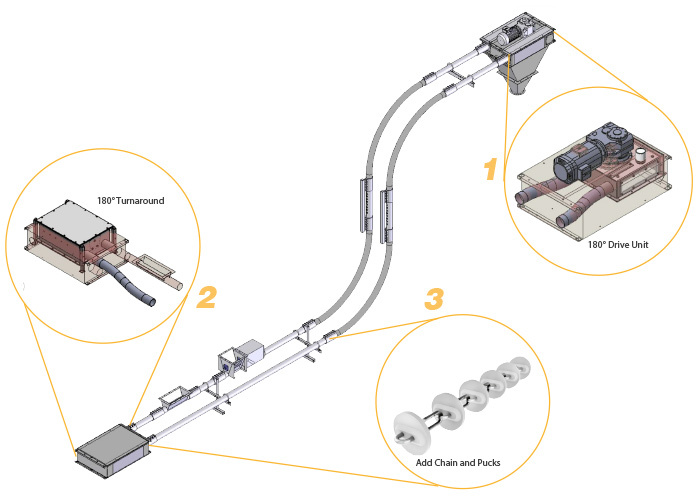 Chain-Vey engineering and sales teams figured out a simple retrofit idea for owners who want to spend less time and money on cable conveyor parts. Because the leading cable conveyors and Chain-Vey tube conveyors both share nearly identical pipe dimensions and designs, it's actually quite easy to replace the insides of an existing installation. The turnarounds and drive units typically need to be swapped out too; but the total savings are large when comparing the two options. Pulling out the entire existing conveyor installation, re-cutting new pipe, installing a completely new drive and turnaround units, as well as any discharges and wiring/controls. Or leaving most of the existing conveyor installation. Only replacing the drive and turnaround units and installing a new chain and discs through. The latter option saves a lot of time and component cost, while capturing most of the improvement in reliability and lower replacement part cost. It's called the Cable-to-Chain-Vey Retrofit. Give our Chain-Vey sales engineers a call to discuss pricing and kit specs. The time to manufacture a kit can be as little as a few weeks. Installation takes less than one day, maybe even half a day. Chain-Vey guarantees that the chain will never break or snap. You will also have fewer maintenance intervals and lower spare part costs per year compared to your existing cable. "A lot of bang for the buck on the retrofit. A good solution to the issues we were having." Will the chains last forever? The chains are so strong that they will last a very long time. Chains may stretch a little over the lifetime of ownership, but the tensioner will absorb any stretching. Do chains ever twist inside a system? Twisting in a chain only happens when the chain is not installed properly, which takes at most a few extra minutes of care when installing. Once the chain is installed correctly, it never twists. If you do accidentally introduce a twist, it's not going to ruin your conveyor or the chain. Just stop the conveyor, locate the twist, loosen tension, unscrew the connection link and rotate till the twist is out. Re-tighten tension. Problem solved. Is chain hard to install? Absolutely not. Chain is really is easy to install no matter how many turns or changes in direction. You just pull it through the same as you would with cable making sure the links are orientated the same direction. Do you sell other cable conveyor replacement parts? Chain-Vey is a product made by MPE and we are not affiliated with any cable tube conveyor manufacturer in any way. Many individual components are wholly different. For retrofit customers though, all MPE provided components can be repaired or replaced by us. But for any remaining parts from the original manufacturer, replacement parts should be sourced from them.